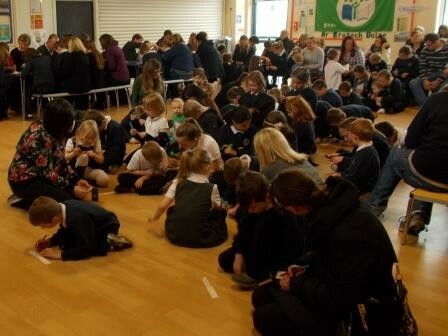 On Thursday 28th April, we hosted a Gaelic Open Afternoon to share our learning with our families and friends! Each class’s IDL had a Gaelic theme – whether it was historical or cultural! Gaelic songs were sung, Gaelic stories were told. Lots of lovely art work illustrated the stories children had been learning about! The Gaelic tradition of the belief in the fairy world was explored – there was even a glittery fairy garden in the grounds of BPS! Many children are going home to create their own. The Clearances were investigated which led to a trip to the Oa on Islay where many crofters left for a better existence in different parts of the world. The roles of the crofters and the landowners were re-enacted during this difficult era. Finlaggan on Islay was also visited and our pupils left with a greater understanding of its historical importance.The children’s class display was widely admired by Mr Donald Bell, one of the trustees. The display will be transported to the Finlaggan Centre during the week of the Feis in May so locals and visitors alike can learn from our children’s hard work – what an honour! A game of Gaelic bingo kick started the event and a Gaelic café were all part of a very busy and full afternoon! Special thanks must go to Lynda Cooper for donating delicious tablet and Irene Stitchell for her mouthwatering pancakes! Parents commented that the afternoon was ‘very busy, very interesting, great variety, exciting’ and it was ‘very entertaining – a lot of useful research. Well done’. Millie from P3 thought ‘it was very good and I enjoyed it lots’! Thank you everyone for attending and we look forward to our next Gaelic event!